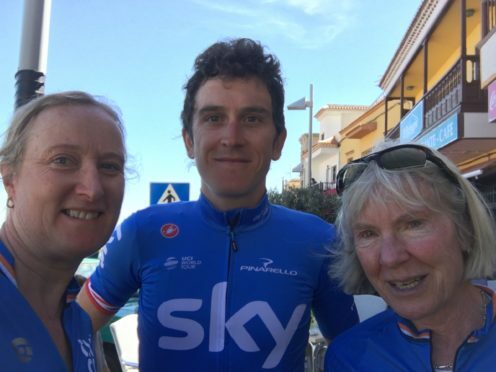 Geraint Thomas meets some of his fans in Tenerife. I’ve been lucky enough to spend part of January and most of February cycling in Gran Canaria and Tenerife. Both are fantastic venues for winter training as the weather is generally warm (although in 2018 we had snow) and the roads are mostly good. For me, Gran Canaria edges ahead of Tenerife in terms of the variety of routes on offer, but both islands, during the winter months, are packed with cyclists battling their way up the long, hot and dusty climbs as the more leisurely tourists laze by the beaches and pools on the southern coasts. It is not just amateur cyclists who are attracted to these winter destinations looking for some early season miles. I have seen Romain Bardet being motor-paced up the GC 605 – the road known to cyclists as Serenity for the untroubled and meandering way it twists and turns, on butter-smooth tarmac up to the head of the barranco above Mogan. I have often seen the Astana team riding as a tightly-packed bunch along the roads of Tenerife and in 2018 I had the good fortune to see the then Tour de France champion Chris Froome and his soon-to-be successor Geraint Thomas at the Parador Hotel, just below the summit of Mount Teide on Tenerife. 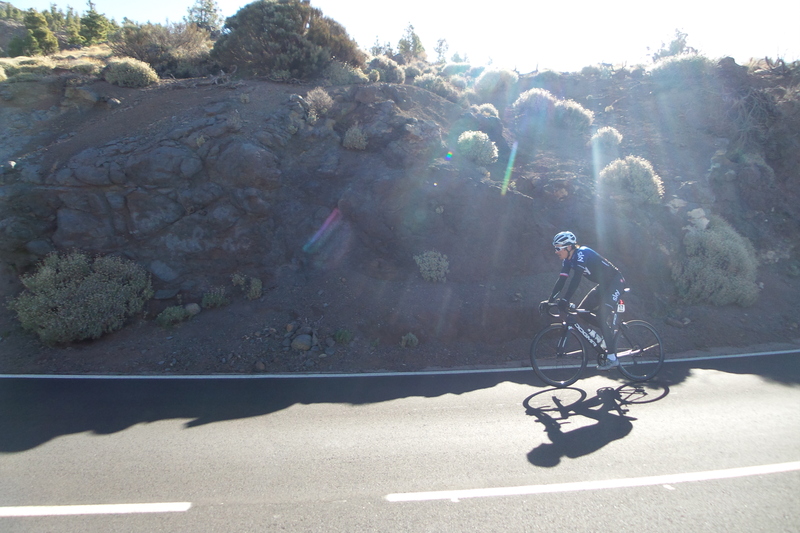 Geraint Thomas out training in Tenerife. 2019 was no different and among the myriad of “pro” jerseys I spotted out on the roads of both islands, Geraint Thomas was again a regular presence. So much so in fact that the clients I was guiding in Tenerife came to expect a daily meeting with him at some point on the roads or in a little cafe on the way. For a rider who was in the midst of preparation and training for his big season of racing ahead of him, he was always gracious and had time to pose for photographs and chat with everyone. It is an anomaly common to cycling that at some point you are bound to bump into one of the top names of the sport. To be the best you need to get out there and ride the trails and roads that all the rest of us do too. It is less likely you will bump into Lionel Messi down the park in Barcelona having a kick about to improve his skills. But when I have been cycling I have bumped into Danny MacCaskill on the trails around Dunkeld, ridden alongside Mark Beaumont, Sir Chris Hoy and Sean Kelly in sportives and crossed paths with many other riders along the way. As the popularity of cycling attracts more sponsors there is a risk that professional cycling becomes less personable, but the evidence is to the contrary. 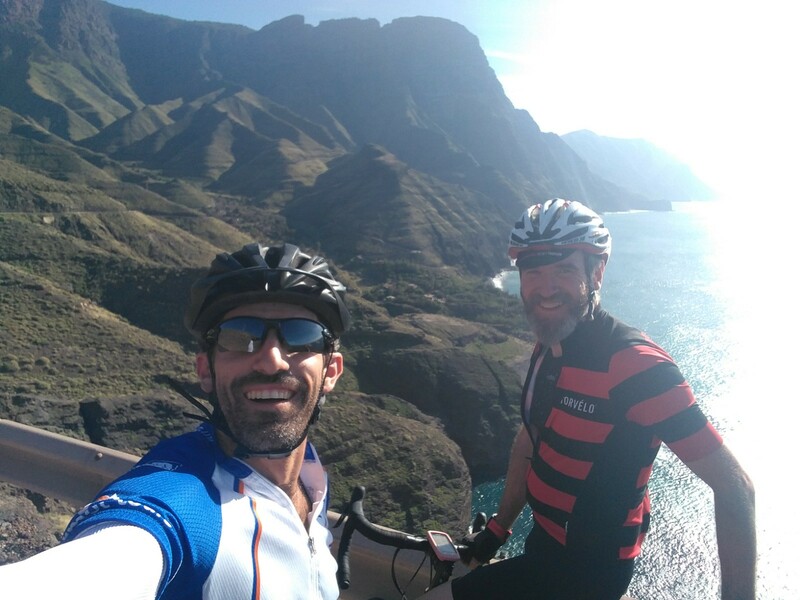 Scot and fellow guide Davide enjoying the roads of Gran Canaria. It is refreshing to see that even the top names in the world of cycling will still be out on the same roads as us mere mortals and take time to acknowledge the support from their fans, even if it is just a quick wave as they hurtle past you on a long climb, not even breaking sweat as you curse the gods of gradient. Details: Serenity is located in the south-west corner of the island of Gran Canaria and has the good fortune to have a little micro-climate all of its own – when the wind and weather is less favourable on the rest of the island you can almost always guarantee a little bit of warmth and sunshine here. The climb itself can be incorporated into a bigger loop that continues upwards to Ayacata and then down to Masapalomas and back to Puerto Mogan along the coast. However, such is the quality of this road it is one that you will want to ascend and also descend. From the top, as you look down the barranco the black asphalt looks like a strand of spaghetti that has been dropped with abandon. Perhaps the only drawback of this climb is that as it is so spectacular it is a draw for hundreds of other cyclists and also tourists in their little hire-cars. So if you want to make the most of the delights of the winding road I suggest an early morning or evening assault.